Complexity theory is a scientific amalgam –an accretion of ideas representing a shift towards understanding the properties of interaction of systems as more than the sum of their parts. While previous bodies of scientific theory were chiefly concerned with temporal progression, complexity theory is equally concerned with space. It’s a theory that asks questions about crises and catastrophes, instability and impasse – a theory that, in other words, one would expect geographers to take to like ducks to water. And yet, geographers have – for various reasons – remained firmly on the land. In this article, I want to produce an account of the dissemination of complexity theory that reinstates the links with geography. In mapping the geography of complexity theory, I want to look at how its metaphors – the verbal or visual images we use to describe it – have circulated around the world through three different but related social networks, whose main purpose is the production of new knowledges: global science, global business and New Age practices. I have chosen these particular three because they are important determinants of our everyday lives. Science, business and New Age matter to people – their discourses are touchstones of many practices; they increasingly play to publics created and driven by the media; and, finally, they are networks that trade with each other. Let’s start by considering the network that is science. Science has changed hugely over the last 20 years. It has become common cultural currency, with scientific and quasi-scientific language widely used in everyday discourse. It has become cosmopolitan on an entirely different scale, and a vital part of this new, cosmopolitan science is ‘mediatisation’. Books, television programmes, and the like sell science: in turn, science sells books, television programmes… Science and the media have become more and more closely intertwined and complexity theory is now one of the major scientific media exports. We can see this in, for example, the activities of the Santa Fe Institute. Founded in New Mexico in 1984, this organisation has attempted to be a centre not only for complexity theory research, but also for its dissemination. It has moved into many fields outside the natural sciences, including archaeology, linguistics, political science, economics, history and now management. Secondly, global business. Since the 1960s, we have witnessed the development of what I call the ‘cultural circuit’ of capitalism, consisting of business schools, management consultants, management gurus and the media. This burgeoning network of business practices has a constant and voracious need for new knowledges and, from the beginning, has provided particularly fertile ground for the dissemination of complexity theory. The need for a constant flow of ideas (often called ‘business fads’) means that complexity theory is likely to receive a warm welcome, while the management seminar has proved a useful way of introducing ideas of complexity into corporate practice. The production of complexity theory is now bound up with business – for example, companies have been established that apply complexity theory to financial markets. Finally, complexity theory has been used to produce a new management paradigm of emergence and self-organisation that can be marketed as a simple set of principles for designing, managing and viewing organisations: these are concepts that particularly fit with many current ideas of management thinking. Finally, New Age practices. New Age consists of a set of organisations which, though not so coherent as the cultural circuit of capital, have nevertheless become a functioning international circuit dependent upon a constant through flow of new ideas. The producers of these ideas are diverse, including new religious movements and communities, spirituality and healing centres, camps, gatherings and businesses. The ideas are distributed in many ways, the chief of which is the seminar or workshop, now a pivot of New Age practices. Complexity theory seems to provide a ready-made vocabulary with which to talk spirituality and metaphors of complexity have become steadily more popular in New Age since the 1980s: they are easily interpreted as the language of the self and self-making; they have provided a vehicle for dissemination of older New Age ideas (such as Lovelock’s Gaia), and their ‘scientific’ vocabulary adds a touch of legitimacy for a relatively small and insecure network. The practices of these three networks have therefore produced a rapid diffusion of the metaphors of complexity which, in turn, have been changed by the new networks in which they can circulate. This trade in metaphors takes place between the network of science and the other two networks and between the two newer networks as well: complexity metaphors travel between science and New Age, between New Age and business and between science and business. Moreover, at certain sites, these networks can physically coincide, and these sites provide particularly important points for the transmission of metaphors since they allow direct interaction to take place. For example, the Santa Fe Institute – one of the major scientific centres of complexity theory – is situated amid the New Mexico desert landscape, which often appears in the work emanating from the Institute as an illustration of the importance of complexity metaphors. As well, however, Santa Fe is one of the key centres of New Age in the United States. In the example of Santa Fe, we can see how networks both interweave in spaces and also interweave spaces. For in all the travellings and encounters of complexity metaphors, the importance of space clearly stands out : the space-time geographies of the social networks have helped to shape their function as shifters of metaphors. They provide a map of where counts: in science, there are the main sites where complexity theory is produced; in business, the map is of the main poles of managerial innovation like Boston; for the New Age network, the map in Britain has been one of margins (for example, Glastonbury). The cultural valuation of the landscapes inscribed on these maps provides a force of identity: thus science gains extra validation from certain stock landscapes such as the two Cambridges; business has its stock of familiar landscapes on both sides of the Atlantic; New Age sites in Britain are often woven together into a mystical geography centred on notions such as Avalon. They are geographies of interaction – of meetings, conferences, symposia, seminars, workshops and emails for science and business, face-to-face interaction through seminars, workshops, festivals and gatherings for the New Age network. Finally, space provides a vocabulary of journeys, maps, shifts and transformations giving the metaphors of complexity a semiotic force, which implies transformation and diffusion – and, of course, also reflects the vocabulary of the geographer. This article is based on ‘The Place of Complexity’ in Nigel Thrift, ‘Knowing Capitalism’, Sage Publications Ltd, pp 51-74, © Nigel Thrift 2005, with permission from the publisher. 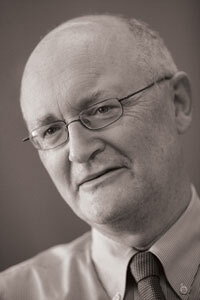 Professor Nigel Thrift FBA is Vice-Chancellor of the University of Warwick. He is one of the world’s leading human geographers and social scientists. He received the Royal Society Victoria Medal for contributions to geographic research in 2003, and Distinguished Scholarship Honours from the Association of American Geographers in 2007, and is an Academician of the Academy of Learned Societies for the Social Sciences.